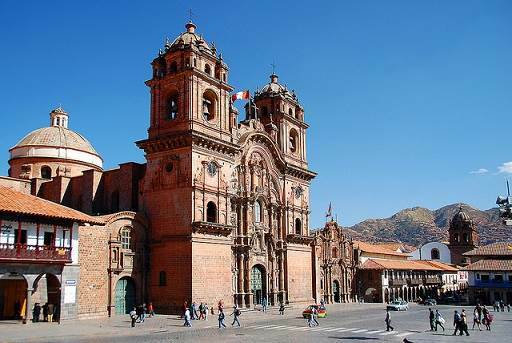 The historic city of Cuzco, which many tourist know of, is part of a the greater global tourist attraction schematic. Throughout the ages, this city has undergone many transformations, reconstructions, and modifications. Beautiful Cuzco is not the Cuzco that once was. One of the most important tume periods for the city was during the Spanish arrival onto Inca lands. Two years after the death of Atahualpa, the Spanish conquistadors reached the city of Cuzco. On March 23, 1534, the Spaniards annexed the city to the Spanish empire. Once setting foot within Cuzco’s then city limits, the Spanish were shocked and impressed by the perfect street system, the extreme detail given to public art spaces, and above all esle, they were impressed by the city’s architecture. The temple of Korlcancha, which was the center of worship for the ancient god Inti, was of great interest to the arriving Spaniards with it being a structure totally covered with layers of pure gold which made the temple shine to the point that the city center could see the illuminant temple. Likewise, the city streets were decorated with gold and silver statues of gods and idols. The statues served as way points and markers for pedestrians and city-goers. The city was so beautiful that the Spaniards themselves claimed it a city fit for the utmost admiration of all of Spain’s kings. The statues, the temple of Korlcancha, and much more were eventually plundered and taken by the Spanish conquistadors. All of the gold was taken and split amongst the arriving Spaniards. The people of Cuzco, who had welcomed Atahualpa’s death because of his involvement in the murder of his brother Huascar, the capital’s Governor and true heir to the crown, fought long hard battles against the invading Spanish forces at Fort Sacsayhuman. The rise against the Spanish was quelled simply because of one lone factor: the Spaniard’s gunpowder. The remaining Incas, led by Manco Inca Ypanqui, fled the city towards Vilcabamba where they established a government and resistance against the Spaniards. This situation caught the attention of the Spanish Military which eventually sent armies to hunt down the remaining Inca resistance. As a result of this campaign against the Inca’s last stand, Cuzco was flooded with Spaniards and turned into the capital of Spanish ruled Peru. Vice lord Francisco de Toledo intervened during this time period. He was set on capturing and disposing of the last Inca king Tupac Amaru. His eventual death marked the end of the Inca’s empire. Throughout the resistance wars, the Spanish migration caused a Euro-urbanization of former capital city of the the Incas. The most important aspect of European-cities were their Plaza de Amras where soldiers were stationed and where they held a vital vantage point within respected their cities. Spain’s colonies were no exceptions, and here at Cuzco, they placed their Plaza de Armas in the former plaza which had served the Incas for the very same reason. Due to the indigenous resistance, the Spaniards decided to turn the Inca’s religious sites into Catholic establishments. The Santo Domingo covenant was built over what was once the Koricancha temple. Likewise, all of the Sun Virgin temples were turned into Santa Catalina monasteries.